Hope everyone had a wonderful Thanksgiving holiday with their families! I thought this cake, which was actually made for a wedding couple and their daughter, would be a perfect design to share after a holiday weekend that brings families together. 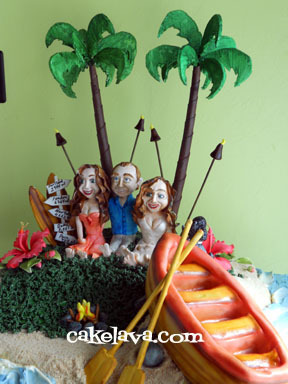 This sculpted island cake complete with custom handcrafted figures, palm trees, rowboat and firepit was made in honor of Christina and Clint's wedding to each other as well as the celebration of their official union as a family with their daughter Kylia and their pet poodle. It was an idea that touched us, to truly personalize the wedding cake to include the whole family. 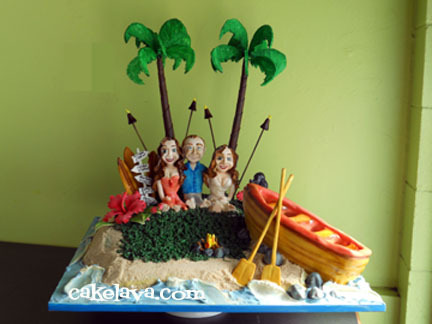 Rick based their wedding cake on photographer Dave and Michelle Miyamoto's island themed design he made for their 2009 wedding. Christina and Clint fell in love with it and asked for a similar design honoring their family with a rowboat instead of the yacht and a poodle instead of a shiba inu. When the cake was delivered, we knew immediately who greeted us because Rick had spent many hours making and painting the figure -- it was Kylia, their daughter, and she got a kick out of seeing herself and her parents on the cake. Everyone loved the cake and felt it really represented the spirit of the couple. Congratulations to Christina, Clint and Kylia! The Heisman Trophy cake had been on the books for a while, and it was a mere coincidence that it happened to be on the same Saturday as the Miami Dolphins Football Helmet with figures wedding cake. Two football themed cakes for diehard football fans, and the pressure was on! I remember when the Heisman trophy cake request came in. I had to look up the name "Heisman" just to make sure it was spelled correctly on the order, (and again had to confirm the spelling for this blog post). We had certainly heard of the Heisman Trophy, it's the most prestigious trophy in college football, but could not tell you who had won one in recent years. As a sculpted piece Rick was determined to make this difficult structure as true to form as possible. 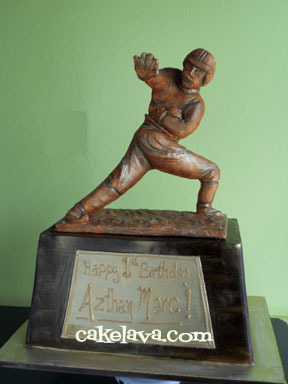 It didn't help that the body in a Heisman trophy contorts itself in a way that doesn't seem natural, or the fact that he had to make the piece look like it was made out of bronze, or that the father of the child who the cake was for was a H-U-G-E football fan -- no pressure there! The sculpted Heisman Trophy was substantial, the photo does not do justice to the size. We were both extremely happy with the completed piece and hope it made a huge impression at the party. When we delivered it to the venue, every football fan in the room who was there setting up commented on how realistic it looked, which we took to be a good sign and a felt a big sigh of relief that Rick had captured such an iconic form as an edible piece. After spending many hours sculpting the piece, Rick as well as myself, will never look at another Heisman Trophy quite the same way again! And the Winner Is .... and a Monkeys Cake! Congratulations to Kim for her winning entry! When asked what she would purchase using her $45 CSN Stores Gift Certificate, Kim wrote: "Oh my... lots to choose from! My first choice would be a Le Creuset Dutch oven. I've been wanting one for a very long time. I also browsed the Bedding for my daughter, she is getting a new bed soon and they have a ton to choose from. Love the styles! Thanks for introducing me to the site. Did not know about them. Fun stuff!" Thank you to everyone who entered the giveaway. We wish we could give a prize to each of you!! 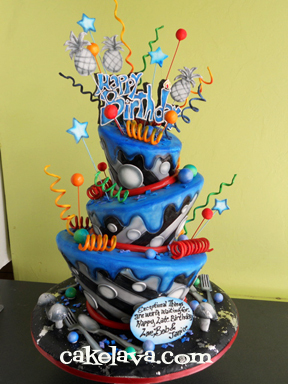 If you have been reading the blog recently you know Rick recreated several of his designs in the past few weeks with only slight modifications including a customer favorite, his "Monkeys" cake. The monkeys cake above was made for a first birthday party for twin boys on November 6th. 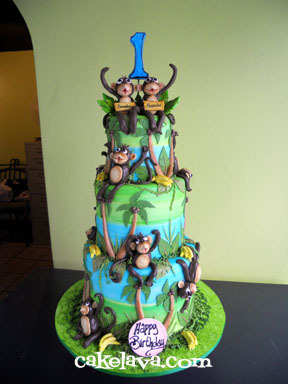 Like his original monkeys cake, the background was the same and each monkey handcrafted and placed in playful positions on the cake. At the top of the cake were two monkeys in honor of the birthday twins Branden and Brenden. The monkeys were holding signs of their names while the others were frolicking and hanging upside down on the cake. The monkey cake matched the decor beautifully. Monkey and banana themed items were everywhere, they did a great job on the setup! Just wanted to thank the both of you for the awesome cake. Not only was it beautiful but sooo delicious!!! to have a piece of the monkey. We began working with Laressa and Daniel in January of this year for their November wedding. They were referred by people we knew and we wanted to give them the cake of their dreams. They desired to have a cake that was both elegant and unique and would long be remembered by their guests. Laressa and Daniel's wedding colors were blue and white and and Rick drew inspiration for the design from the stylized blue floral motif on their invitation and wedding paperie. Rather than put the pattern on a traditional 3-tier round, he gave the cake a modern, feminine shape with rounded edges and each tier balanced slightly above. Laressa and Daniel were so excited about the cake when they saw their design. I even got a nice call from Stephanie their wedding coordinator shortly before the wedding to work on the cake table. They wanted to have just the right color linen and size for the table. A couple after our own hearts! The table looked perfect! 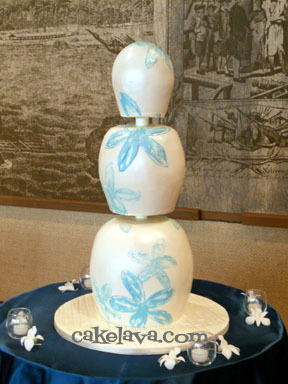 The cake drew a great deal of attention when we delivered it to the beautiful Halekulani resort in Waikiki. We had both the staff and the coordinator of the wedding surrounding the cake table, and some fascinated looks and "What is it?" questions. To which Rick smiled and proudly said "It's a cake!" Sadly, we did not get a chance to congratulate Laressa and Daniel on the wedding day. We really wanted to. 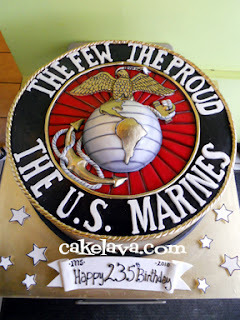 It was a hectic weekend for us and we had to run back to our studio for Rick to work on the U.S. Marine Corps birthday cake for the following day and cakes throughout the weekend. We just came back from Hawaii and we wanted to send you and Rick a note to thank you for an amazing/tasty cake. Everyone, including the catering folks at the Halekulani, were impressed with the cake. We even took the leftovers to our honeymoon and enjoyed it with coffee and tea. Congratulations to Laressa and Daniel! For some unexplainable reason, on Saturday we had two football themed cakes, and one of them was actually a wedding cake! We get the sculpted football cake request somewhat regularly and make the occasional football helmet which is much more difficult than the football shaped cake. 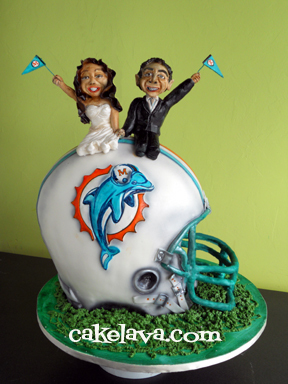 For months we've had these two football cakes on our calendar for November 13th, one being a Heisman trophy which can send one into a little panic attack, and this sculpted Miami Dolphins Football Helmet wedding cake with custom bride and groom toppers waving penant flags. The funny thing about these football themed cakes is that Rick is not a sports fan. Turn on a football game and he will probably leave the room, yet, he puts just as much time and attention into these cakes as he does themes that he is more interested in. He knows how important football is for the client and he wants to give them his best effort. Our dedication to football aside, Rick and I both fell in love with Kristi and Justin's Miami Dolphins Football helmet wedding cake. It was a perfect match for the couple who were having a non-traditional wedding reception, complete with casino tables. Rick made handcrafted custom figures of the bride and groom in their wedding attire to be placed on top of the helmet and it really took the cake to the next level. 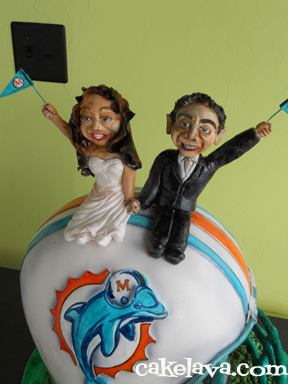 Their love of The Miami Dolphins and of each other made for a winning union -- Touchdown! Our CSN Stores sponsored giveaway is still running on the blog through tomorrow, November 17th at Midnight PST. Thank you to those who have entered. You can earn an additional entry by posting the link to the giveaway on twitter. 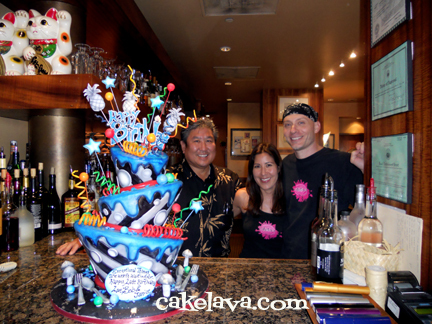 The cake was a last minute request ordered as a surprise gift for Chef Alan Wong of Alan Wong's Restaurant and The Pineapple Room by Alan Wong. The woman had called in a panic, "I know this is last minute ..." -- she was so sweet, I would have moved mountains for her if I could, but try and squeeze a cake into Rick's schedule when he is already booked, and my hands are tied, there is absolutely nothing I can do. Even if the cake is for Alan Wong. It pained me to say no to our client, she was so excited about surprising him with a cake and I dearly wanted to be able to help her. She was hopeful and asked when our next availability was. I told her that we could probably do it for Friday the 12th and she said that would be okay, it would be a belated birthday gift for him. She called over to his project manager just to make sure he would be in town and it was a Go! I went into the kitchen to talk to Rick. "Okay, now this is for Alan Wong..." and he knew immediately what that meant. It meant, it better be AWESOME! Chef Alan Wong has long been one of my culinary heroes and consistently wins awards as one of Hawaii's top Chefs. Alan Wong's Restaurant is considered by many to be the best restaurant in Hawaii and his New Wave Luau Cookbook is absolutely gorgeous! He's made countless local and national appearances and his food is sublime! 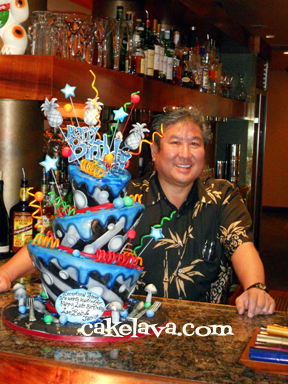 As someone who spent 8 years of her life slaving over a hot stove in my previous career, and who had one of her best meals in Hawaii at Alan Wong's Restaurant, it was a huge honor to have my husband make his birthday cake! Our client wanted a FUN, whimsical wonky cake for Alan that included some of his favorite colors and would really WOW him! She asked for pineapples (since he owns The Pineapple Room) to be included in the design and possibly a mushroom or two. On the plaque she asked for the writing "Exceptional Things are worth waiting for. Happy Late Birthday, Love, (their names)." After some discussion we selected our Banana Blueberry Mascarpone flavor for Alan. It's one of our favorite flavors and we thought he would love it. When we met Alan to present the cake to him, he had a huge smile on his face. He has a warm disposition and treated us like we were guests in his home. He seemed fascinated by the cake, I don't think he's had a cake like this before and were so honored to make it for him. He chose the front of the bar area in the restaurant to display the cake during the dinner service. His pastry team was brought out to see the cake and meet Rick and we took some photos with Alan. It was a special night that we will never forget! We want to thank our client for giving us the opportunity, and wish Alan a Happy Belated Birthday! Our CSN Stores sponsored giveaway is still running on the blog through Wednesday. Thank you to those who have entered. You can earn an additional entry by posting the link to the giveaway on twitter. Happy 235th Birthday, United States Marines! Last Friday, November 5th, we celebrated the 235th Birthday of the United States Marines. 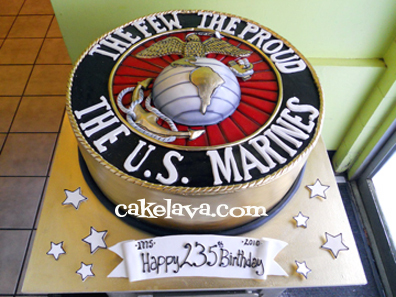 This is the fourth cake we have made for the U.S. Marines Birthday Ball, and each year we do a different design for them. This year however they surprised us and asked for the same design as last year, with just a couple minor changes. Rick added a ribbed effect to the red area and made the whole side of the cake a beautiful gold color. The cake was just as massive as last year and the same flavor, Strawberries Chantilly was ordered again. The officers who greeted us were thrilled with the cake and we were very happy with it as well. We want to wish the United States Marines a Happy 235th Birthday, and we look forward to serving them again next year! THIS GIVEAWAY IS NOW CLOSED! If you submitted an entry past Midnight PST on November 17th, your entry was not counted. Thank you to everyone who entered the giveaway! We are excited to announce a fantastic new giveaway for our readers just in time for the holidays courtesy of CSN Stores! If you haven't had the opportunity to visit one of the 200+ online stores at CSN, you are certainly missing out. Whether you are looking for a special gift or something new for yourself, there are over one million products to peruse at CSN! In my most recent "travels" to the site, I found the cutest aprons (see below), fabulous cookware, and some amazing upholstered headboards. As the sponsor for our giveaway, CSN Stores is generously offering a $45 gift certificate to one lucky "Musings from Cakeland" reader and we couldn't be happier! We want our faithful readers who have supported our blog to be rewarded with a little retail therapy at any of their stores! How CUTE is this! 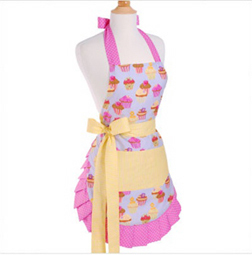 I found the Flirty Aprons Women's Apron in "Frosted Cupcake" on Cookware.com and at $34.95, it can be purchased with your gift certificate! This giveaway is available to residents of the U.S. and Canada ONLY. Please be aware there may be shipping charges for certain items. To enter the giveaway, simply visit CSN Stores and leave us a comment telling us what you would like to purchase using your $45 gift certificate. The giveaway ends on Wednesday November 17th at Midnight PST. One winner will be chosen randomly and announced on Friday November 19th on our blog. Special thanks to CSN Stores for donating the generous prize! Good luck everyone! In the past couple of weeks Rick has had the opportunity to recreate some of his previous designs. 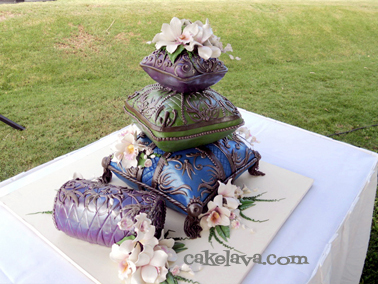 Our "Pillows" cake has been widely circulated on the internet and in print since 2008 when it was designed for a wedding. The original "pillows" cake had an Indian flair to it because it was designed for yoga instructors. 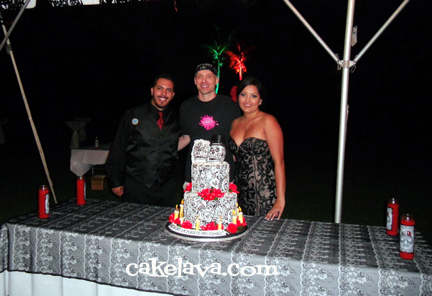 On October 30th, a few hours before the "Dia de los Muertos" wedding cake was delivered to Katie and Chuck, we celebrated Naomi and Roy's wedding at an oceanfront venue in Ko Olina. Naomi and Roy's wedding colors were metallic blues, greens and purples and their accent color was coffee brown. The couple are Filipino and desired to have their heritage integrated into the design and provided us with Filipino patterns to use on the pillows. It looked absolutely gorgeous and was meaningful to the couple. For the Indian pillows cake Rick made handcrafted whimsical looking stylized flowers and for Naomi and Roy, opted for more delicate orchids in whites and soft pinks. Congratulations to Naomi and Roy! 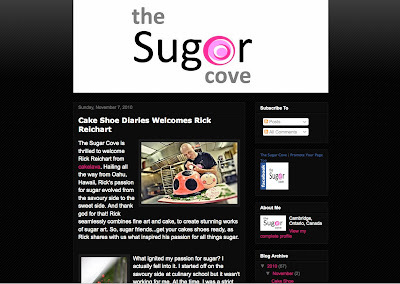 "The Sugar Cove" blog has a wonderful interview blog series called "Cake Shoe Diaries" which features a different cake designer each month. Rick was invited to be the November feature, and he felt honored to do it. 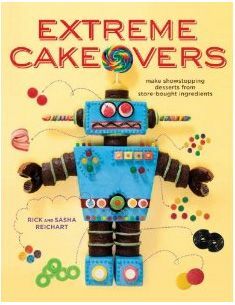 Angela, the owner of The Sugar Cove blog interviews each of her selected cake artists to find out what ignited their passion for sugar. In her interview with Rick she asked him how he got started, what keeps him motivated, what principles guide his work, and what advice would he give to others just starting out. Click the above link to read the interview and feel free to leave comments for Angela as she works hard on this series. 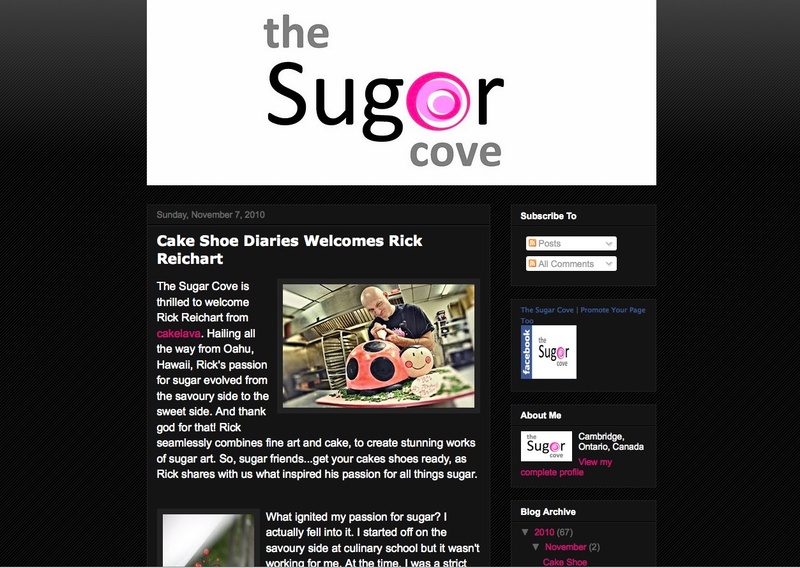 Thank you Angela for featuring Rick and for your continued passion of all things sugar! Yesterday we shared Nicole and Kareem's modern fall wedding cake and today it's all about his Groom's cake! Nicole ordered a basketball Groom's cake (Peanut Butter Fudgey flavor) as a surprise for Kareem on their wedding day. Rick added a handpainted logo of Kareem's favorite team, the LA Lakers and along with Kareem's last name and his high school team number. It was pure coincidence that their wedding cake used a similar shade of orange in it and that worked out perfectly. Wish we could have seen the expression Kareem's face when he saw his gift! It's beginning to feel a lot like Fall over here. It's been overcast the past couple of days and temperatures are dipping into the low 70's -- brrr. We're making more fall themed wedding cakes, like the striking design above. 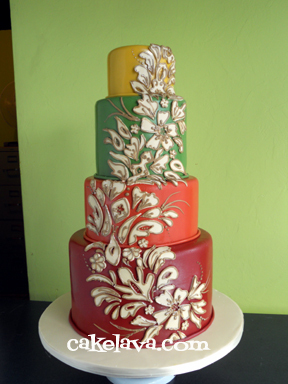 For Nicole and Kareem's wedding cake Rick used their fall colors to inspire his design which had a cascading pattern of leaves and flowers. The couple used tropical flowers in fall colors throughout their wedding but did not have a "Hawaiian/tropical theme". Rick made his floral pattern with a Hawaiian flair but desired to emphasize more the feeling of Fall. Nicole and Kareem were married at Lanikuhonua, a gorgeous tropical/oceanfront property, with 350 guests in attendance. Nicole also ordered a groom's cake as a surprise for Kareem which we will be sharing on the blog tomorrow! This year the Mexican holiday Dia de los Muertos (Day of the Dead) which is celebrated annually on November 2nd happens to coincide with Election Day. While the holiday of Dia de los Muertos focuses around gatherings honoring deceased loved ones, (hence the skull motifs) it is also a time of great celebration. Elaborate altars of sugar skulls, flowers, candles and fruit are created and it you've never seen one in person, they are exquisite works of art, full of color and spirit! Last Saturday night, our couple Katie and Chuck were married in a "Dia de los Muertos" themed wedding at the gorgeous Loulu Palm Estate on the North Shore. Their wedding colors were black, white and red which were also the colors used on their wedding cake, except for gold in the candles. Rick spent hours working on the super detailed stylized skulls and flower print on the cake. 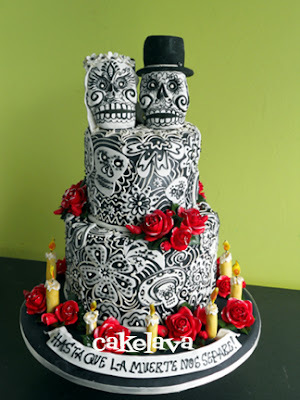 The roses and candles were handcrafted, as were the custom bride and groom skull cake toppers. At the bottom of the cake he wrote at the request of Katie and Chuck "HASTA QUE LA MUERTE NOS SEPARE", 'Til death do us part. Katie and Chuck, who both work for the famous L.A. radio station KROQ, both wore black. Katie looked stunning in a black lace fitted gown and Chuck was dashing in his black shirt and vest with his red tie. They flew in L.A. photographer/filmmaker Cale Glendening who was a perfect choice for the couple. Katie and Chuck have been wonderful to work with during the whole design process. Rick was a big fan of KROQ when he lived in L.A. and when they found this out, they sent us a box of t-shirts and other items from KROQ which we now both proudly wear. When we met the couple at the wedding they were warm, fun loving and as sweet as can be! They were ecstatic when they saw their cake, which put a huge smile on our faces! Wishing Katie and Chuck our best! Rick with the happy couple! It's been over a year since we first met with our clients Allison and Adam to discuss their wedding cake design. During our meeting the couple spoke of their love of San Francisco, where they currently reside and their desire to have a sculpted cake incorporating San Francisco landmarks of importance to them. We thought it was a great idea! I used to live in the Bay Area, and spent a number of years in San Francisco and was excited to revisit this spectacular city once again and Rick was too! 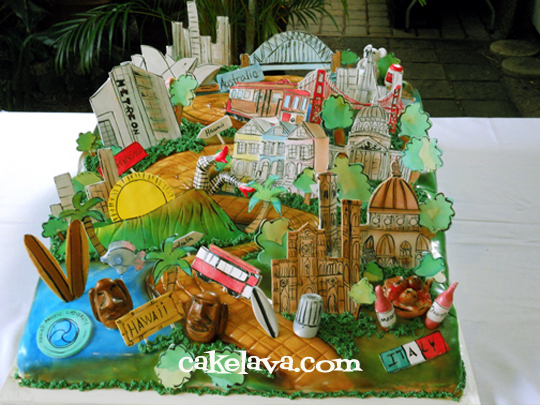 As we began working more closely with Allison and Adam the cake design evolved from a strictly San Francisco landmarks theme to one that included other countries and places that the couple spent time, including Hawaii, Italy, and Australia. Their wedding cake would tell the "story" of Allison and Adam and Rick was looking forward to making it for them. The cake was designed to work chronologically with the uniting "road" being the iconic and super curvy Lombard Street in San Francisco. Adam and Allison were depicted near the bottom of the cake, on the start of their path -- Allison as a chef's toque and Adam represented by a surfboard. Both Hawaii and Italy are shown here. Adam was originally living in Hawaii attending a University here and Allison was studying abroad in Italy. They met at the Metreon theater in San Francisco, spent time together living in San Francisco and then got married at City Hall. 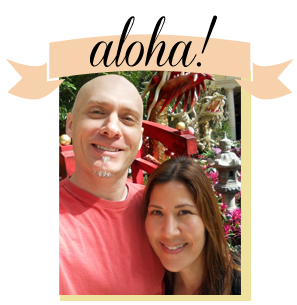 Our couple was already married when they booked their wedding cake but was planning a wedding on Oahu where their family and friends could be a part of their vows and ceremony. Their life in San Francisco made up the majority of this cake. At the very top was Australia where the couple plans to live together. Rick spent many hours carefully drawing and painting every building and detail. Considering the other cakes he was working on for the weekend which also demanded a high level of artistry, I was truly amazed at what Rick accomplished over the course of a week! 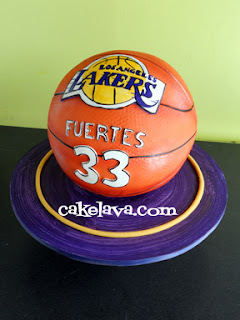 You can check back on our blog throughout the week to see some of these cakes. When Allison and Adam chose their cake flavor, Hawaii Five-0, they had no idea how appropriate it would be at their wedding venue. The private estate where they were married on Friday night is also "home" to one of the new "Hawaii Five-0" TV show characters, and they regularly film there. What a coincidence! Congratulations to Allison and Adam!